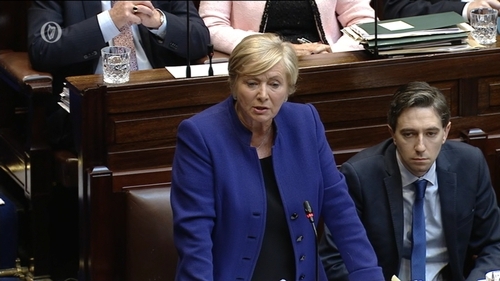 Minister Simon Harris has called on Fianna Fáil leader Micheál Martin and Sinn Féin president Mary Lou McDonald to apologise to former tánaiste Frances Fitzgerald. Speaking in Dublin, the Minister for Health said that Ms Fitzgerald was hounded from office and now deserved an apology after being vindicated by yesterday's third interim report from the Disclosures Tribunal. Asked if he would like to see Ms Fitzgerald back in Cabinet, the minister said that was not up to him, but he hopes she "plays a major role in Irish politics". However, in a statement, Fianna Fáil said Ms Fitzgerald had to resign because it and "the majority of the Dáil had lost confidence" in her. The party said that this followed "a trail of mishaps, including forcing the Taoiseach to mislead the House on numerous occasions. "No finding of Mr Justice Charleton disturbs that fact and every Government Minister is accountable to Dáil Éireann." Meanwhile, Sinn Féin leader Mary Lou McDonald has declined to apologise to Ms Fitzgerald. Responding to Mr Harris's suggestion, she said the only person owed an apology was Sgt Maurice McCabe, and the story was not about Ms Fitzgerald. Ms McDonald also declined to say if she accepted yesterday's report vindicated Ms Fitzgerald. Ms Fitzgerald resigned in November 2017, the day after Fianna Fáil's justice spokesperson Jim O'Callaghan told RTÉ that she would force the country into an election unless she stood aside. Yesterday, the third interim report of the Disclosures Tribunal fully accepted the evidence of Ms Fitzgerald about her knowledge of, and responses to, an alleged garda strategy to undermine the reputation of garda whistleblower Sergeant Maurice McCabe. Mr O'Callaghan has defended his actions in the lead-up to the resignation of Ms Fitgzerald. Speaking on RTÉ’s Morning Ireland, he said that there were "political reasons" why Fianna Fáil, along with most of the Dáil, lost confidence in Ms Fitzgerald. He said that while he accepted the findings were a vindication of Ms Fitzgerald, their position in November 2017 was a political judgement, similar to Taoiseach Leo Varadkar's loss of confidence in Denis Naughten yesterday, and they had "a responsibility to act". Ms Fitzgerald gave information to the Taoiseach, Mr O'Callaghan said, and as a result of that, incorrect information was given the Dáil. Mr O'Callaghan said he bears no grudge against Ms Fitzgerald and it was up to the Taoiseach to decide if she would be brought back into the Cabinet.